HairDesigns™ new Frangia Bang, give yourself bangs instantly! • Beautiful, lightweight, and easy to apply, no other bang can compare to ours! • Made from 100% Remy Hair, you can customize the Frangia Bang to match your color and style. • Sonia's Secret Tip: If the hair on top of your head is thinning, our Frangia Bang can be used in reverse on the crown of the head to provide extra volume. Be sure to remove extension prior to washing. Care for your Frangia Bang as you would your own hair by using quality shampoo and conditioner. The Frangia Bang should not be washed daily, just when needed. If it becomes dry, use high quality nutritional oil for hair. After you wash, you may restyle your Frangia Bang using high quality straighteners, curling irons, or brush and blow dryer. For highlights or to change color of your Frangia Bang, rely on your professional hair colorist for best results. The Frangia Bang utilizes special coated micro‐clips and silicone strip to ensure "No Damage" wearability. The Frangia Bang can be styled while you wear it, or before putting it on. It can be curled and straightened just like your own hair, and if you use hair spray be sure to use nutritional oil after you wash it. If you would like a layered look or shorter style with your Frangia Bang, we recommend your consult your stylist to achieve the look you desire. Easily apply to clean hair. Position the clips on the middle of your part, higher or lower to suit your style. 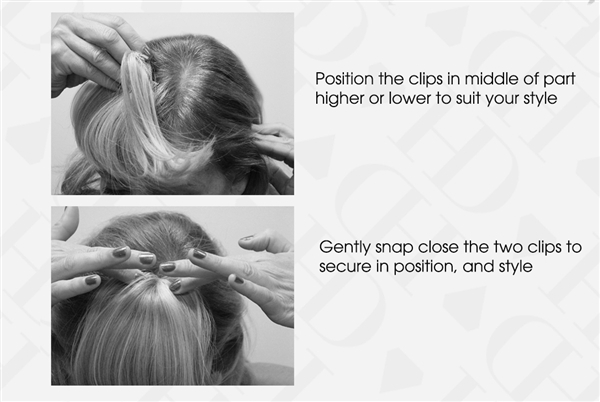 Gently snap close the two clips to secure position, and style- as simple as that!